Bad knee....is there any hope of playing? Post subject: Bad knee....is there any hope of playing? Somehow I destroyed a knee. I'm wondering (short of surgery) how others have overcome physical issues. I'm particularly interested in adjustments for LP play. I was primarily chopping....but that ain't gonna happen anymore. Post subject: Re: Bad knee....is there any hope of playing? I'm sorry to here that. Injury is no joke. If you don't want to move as much penhold with long pips is a viable option. I won't recommend LP shake hand blocker as you would still need to topspin on the forehand requiring a strong knee for moving. What kind of set up would you recommend? 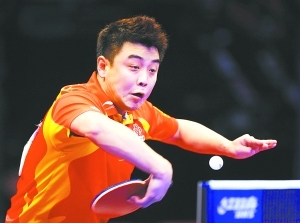 Any Chinese long pips on the forehand with or without sponge. Inverted on the backhand side (weather you use this to RPB is your choice but you should use it to serve.) Learn basic penhold LP technique (side swipes, smashes, chop blocks). There is actually a great thread going on about it this past month. Blocking will be your bread and butter as you can't move very well so you need to be able to block very consistently and when given the opportunity finish the ball with a smash. Have you had a diagnosis of what exactly is wrong with your knee? I had a knee cap that dislocated 3 times and was fractured once by the time I was 22. I had an operation called a patello-femoral reconstruction, discovered table tennis while recovering, and as they say in the classics, the rest was history. My operation was successful and I move as well as anyone I know that is my age (happy birthday to me by the way ). So there may be hope, depending on what is wrong. Your answer is Seemiller grip. Great for blocking and looping. I use anti on the backside. Can just roll the forarm to block with anti on the backhand side or attack with the primary side. Instant choice. I use anti or LP on the forehand, and loop the backhand much of the time. Doesn't require a whole lot of moving if you stay near the table to block. And the backhand I think requires less movement than the forehand for looping. Since you play the ball in front of your body, and the forehand makes you get to the side of the ball. But you can move your forehand to block easy enough from the backhand ready position. With Seemiller grip, you just move the bat in front of the ball no matter where it is. No need for the backhand, forehand side is used all across the table. Sorry to hear that - every time I have a hint of injury I ask myself a question "What if I can't play TT anymore" and it gives me nightmares. As others have said, assuming it won't heal in time, you are probably looking at 'close to the table' play style - which can be fun in itself. I would chop block the heck out of the ball! Coincidentally enough, I do use a variant seemiller grip for my style. Although since going backhand heavy, I generally use a much more backhand loaded grip and the seemiller seems somewhat difficult to use with LP/anti on the forehand when reaching far to the left side (for a right hander) - since the bat needs to be so opened when receiving heavy top spin. A similar problem exits when using inverted, only it would be troublesome against pushes in that case. Trying to have your forehand rubber face the ceiling when on your far left for example. I'm not sure how you can push against a chopped ball to your far backhand side using a seemiller grip! Unless you either remove your index finger entirely, or... use the backhand side! And I like to attack on the backhand with loops. But my 'seemiller' style has it so when going forehand grip, my middle finger is outstretched and not wrapped around the handle at all (no thumb on the backside though). Doing that, I can block from all sides of the table using the forehand. I don't think there's an actual need to go to penhold or Seemiller grip, plain old shakehands will work for a close-to-the-table pushing, blocking and hitting game. No real need for long pips, either, though it'd be an interesting thing to learn to use (and it takes some learning to use). If you're used to two wing inverted shakehands it'd be a matter of choosing slower rubber and/or thinner sponge, maybe even a slower blade. You COULD switch to medium/short pips also, on one side or both. The advantage of penhold and Seemiller grip is the middle - the transition between forehand and backhand - for these grips there isn't one. Since you use the same side of the bat for forehand and backhand blocking in the middle is made simpler. In the case of penhold, the price is a somewhat cramped backhand (you have to twist the wrist to get a closed bat on the backhand, though these days some people use RPB, though that's seemingly used for loops mostly) and limited reach on that side. The Seemiller backhand is somewhat limited in the case of loops, but if you're playing close to the table you won't be looping on the backhand in any case. Achieving an open racket on the backhand might be a problem (you need to twist the wrist and/or change your grip) but I've seen Danny Seemiller do it, even play chop defence on the backhand. Also for the penhold... if you use the grip with your 3 fingers extended, your traditional backhand is even more limited. Try gripping your blade that way and blocking on the backhand side. With the traditional "closed fingers" grip, you can block easier with more angles but the RPB is much harder to do imo. As you've noted, a grip change will be needed - for either the seemiller or penhold grip on the far backhand sides. Whereas blockers like He Zhi Wen who don't RPB at all, have the more tucked away fingers to allow for more wrist rotation at the table. Depends on the variant of seemiller. A true seemiller where your index is curled around the blade makes it quite easy to push by pointing the grippy inverted toward the ceiling. The ann alvarez grip (where you make a V with thumb and index on the back side) is far more difficult to push on the BH...you can do it, but it's hard. I played this way for a while. SH to penhold is a far greather departure than SH to Seemiller IMO. I went from Jpen to SH and it was excruciating. Playing Seemiller (or Ann Alvarez) shares a lot in common with SH. I concur with the recommendation to play close-in with a windshield wiper grip, be it traditional Seemiller or Ann Alvarez (like I use, USA1750 level). Equipment choice is critical for this style so if you're thinking of trying this I can add more to this thread..